Gabby and the wheel du jour. Science, Technology, Engineering, and Mathematics (STEM) curriculum can prove that there are multiple ways to learn and express oneself in academic settings. The Community Cycling Center’s emerging STEM Bike Mechanics program brings together physics concepts, job skills training, mentoring, and apprenticeship to ensure students achieve academic success, and feel prepared and supported after graduation. Through project-based, hands-on learning, we are helping alternative high school students gain credit toward graduation by offering physics courses that focus on basic bicycle mechanics. Since piloting the program in 2015, over 65 students have participated, all of whom attend alternative schools in North and Northeast Portland: Helensview High School and Rosemary Anderson High School. Gabby struggled in the first two high schools she attended. Now enrolled at Helensview, she is more deeply engaged in the learning process and experiencing greater academic success. 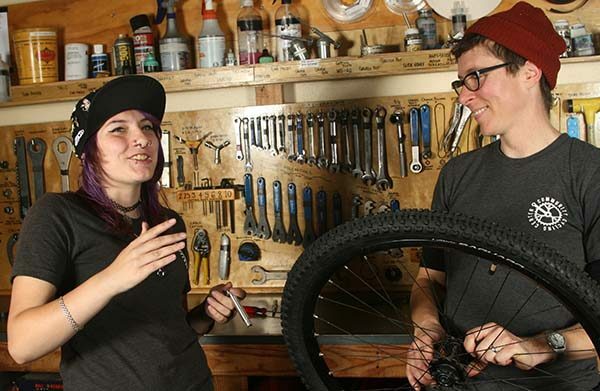 Two years ago, Gabby enrolled in the STEM Bike Mechanics class taught by Andrea Chiotti, a talented educator and skilled mechanic who has worked for the Community Cycling Center since 2011. Andrea and Gabby explore the physics of force. Gabby earned four credits towards graduation in one semester of STEM Bike Mechanics. Students earn one-half credit every two weeks for attendance, plus Science and Math credit upon completion of the course. They also earn their own bicycle from the Community Cycling Center. 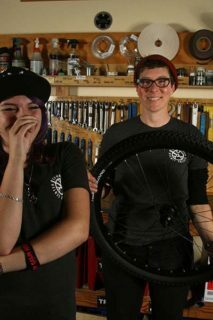 Early last year, Gabby started her first paid job as an intern with our Alberta bike shop and Bike Repair Hub in New Columbia. 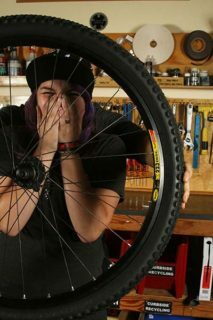 She completed her internship in October and is currently enrolled in her second semester of STEM Bike Mechanics. This week Helensview STEM Bike Mechanics students, including Gabby, are participating in a full-week Mechanic Intensive Training. Stay tuned for more STEM stories! Special thanks to the Oregon Community Foundation, Lam Research, DK Whitaker Engineering, and Intel Corporation for supporting our STEM Bicycle Mechanics Program.